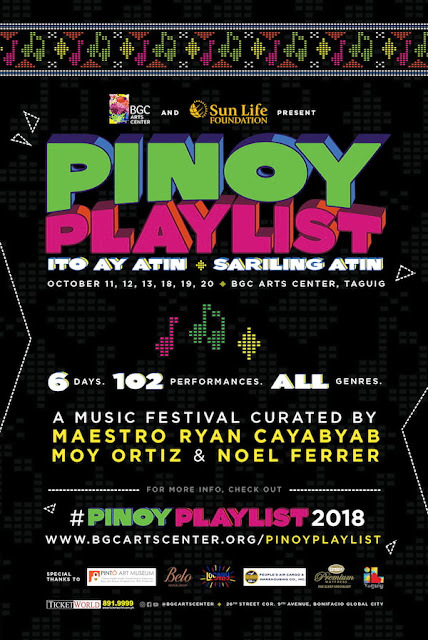 Pinoy Playlist is a 6-day celebration of Filipino musical talent across all genres and decades. Co-curated by Maestro Ryan Cayabyab, Moy Ortiz and Noel Ferrer. Pinoy Playlist brings together over a hundred artists for an extraordinary Pinoy Music festival. This was born out of the idea that we have to revive the foundations of our collective memory through music as Filipinos. This is living proof that Filipino musicians are committed to create living memories out of the music we create. *Venues have limited seating capacity. *Schedules and performances are subject to change without prior notice. *There will be no cancellations or postponement to a later date for reasons related to inclement weather.